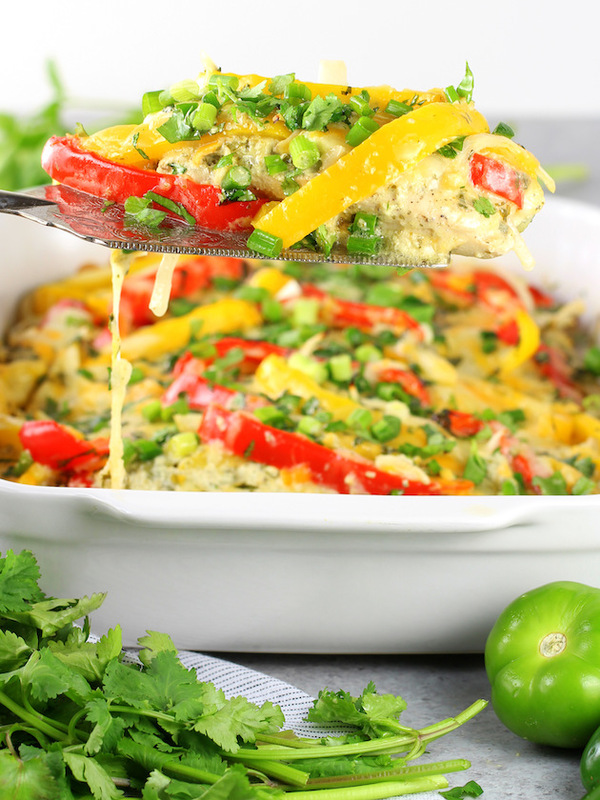 This Salsa Verde Low Carb Chicken Casserole is muy delicioso! It’s one of those easy chicken casserole recipes that is quickly going to become a family favorite. By know you know I’m all about an easy weeknight dinner. And if I can make it low-carb, then that’s even better. I feel like we eat so many carbs without thinking about it, it’s nice to have some chicken casserole ideas in the rotation that are packed with lean protein and healthy veggies… sans the carbs. 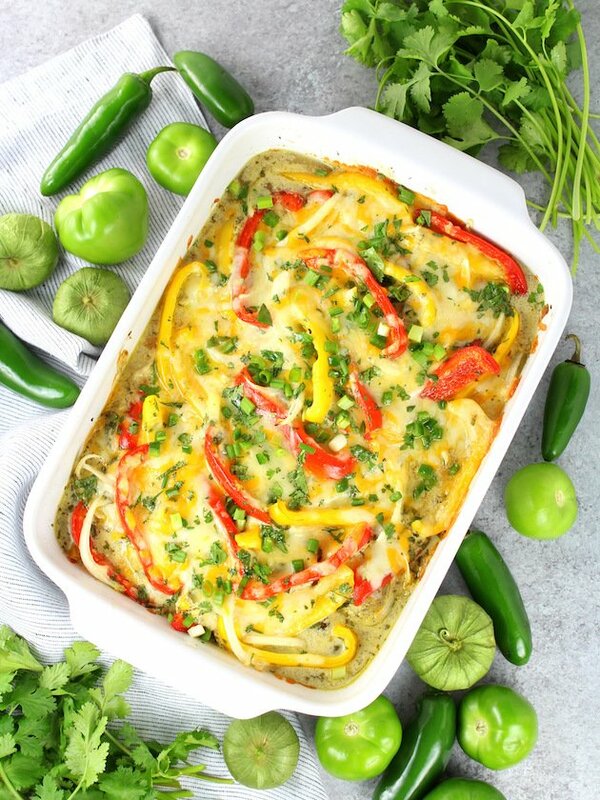 That was where my head was at for today’s yummy recipe… Salsa Verde Low Carb Chicken Casserole! 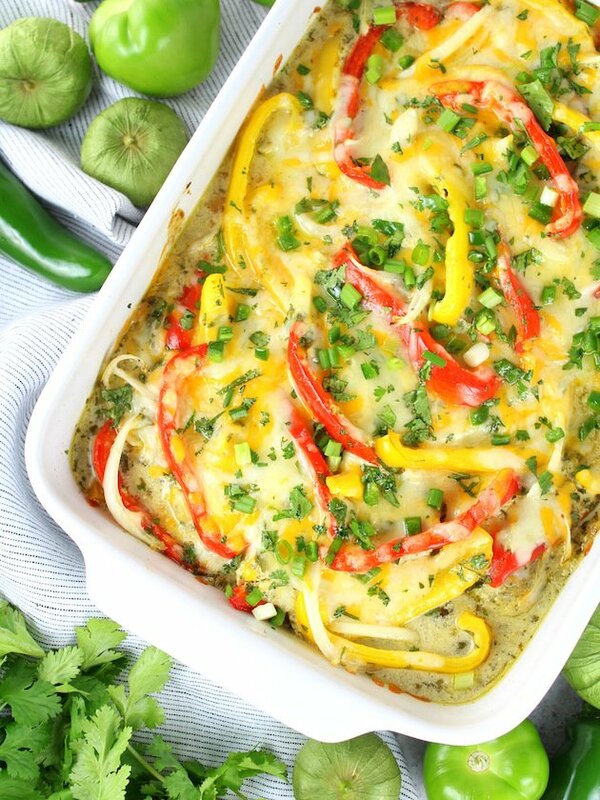 It has tender chicken, fresh peppers and onions, layered with the most creamy and tangy sauce, all topped off with some shredded Mexican cheese! It’s muy fantastico if I do say so myself! In case you’re not familiar with Salsa Verde it’s a green tomatillo style salsa that you can make yourself or buy pre-made. 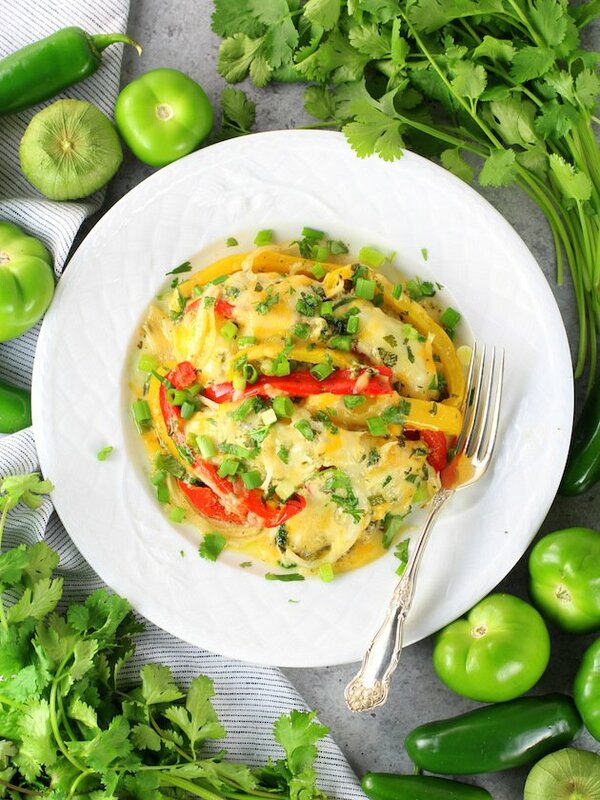 It typically has tomatillos, jalapeños, onion, lime juice, garlic and cilantro. And it can be as spicy as you want, depending upon your tastes. 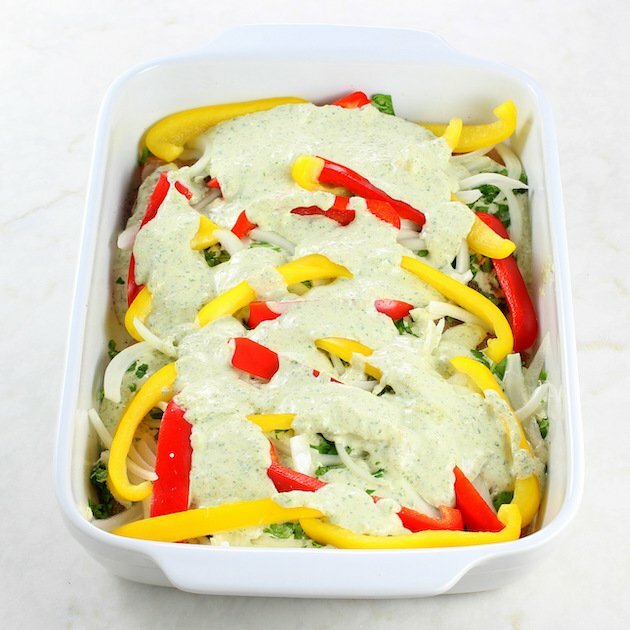 I used a premade medium heat salsa verde for this creamy chicken fajita casserole. I combined it with sour cream to create the most divine sauce ever! 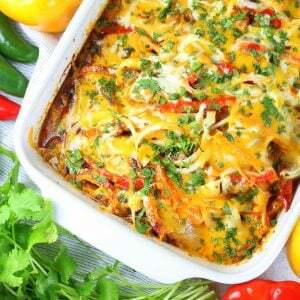 Wondering what to serve with this Mexican Chicken Casserole? In keeping with the low-carb theme I would recommend some low-carb tortillas and turn it into tacos, enchiladas, burritos, or Mexican pizzas. There are several different options to choose from… OR you can even make your own low-carb tortillas! 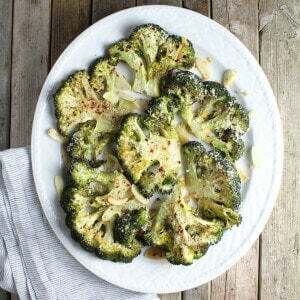 You could keep it really healthy and serve it with some leafy greens or even a Mexican Cucumber Salad. If low-carb is not a priority, another great option is to add some pinto beans into the mix. Just place a can or two of drained, rinsed pinto beans in the bottom of the casserole dish, and layer all the other ingredients on top as specified in the recipe. 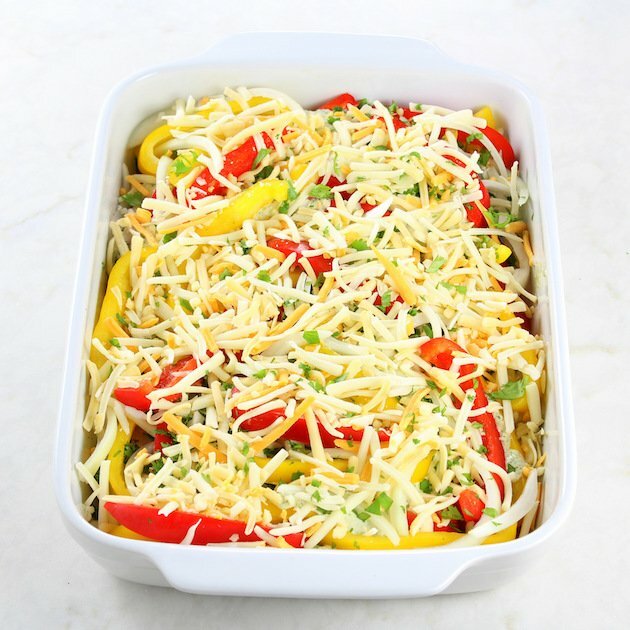 Or you could enjoy this low carb chicken casserole Sander style and just grab a fork and eat it straight out of the pan. What can I say? When it comes to deliciousness we sometimes loose our manners. I’m sure you know nothing about that. Ahem. 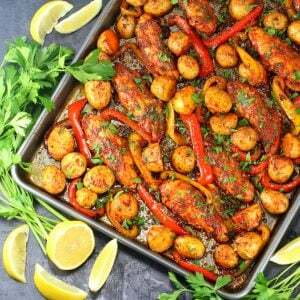 This yummy low carb chicken recipe is not just delicious it’s incredibly easy to make as well. First, preheat your oven. While it’s heating up, prep your peppers and onion. Cut one onion in half, then slice it very thin and separate the layers. Use two colored peppers, remove the stem and veins, and slice thin as well. Then you mix your salsa verde, cilantro, cumin, garlic powder, almond flour (or regular flour if low-carb is not a factor) salt, pepper and sour cream together in a bowl. Heat up 2 tablespoons of butter in a medium saute pan on the stove over medium heat. 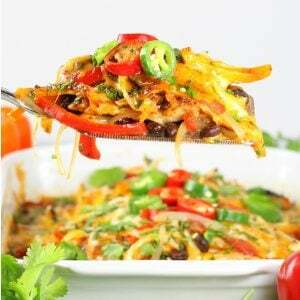 Add the sour cream mixture – cook and stir for 3-4 minutes but do not allow it to start to simmer. Now add the salsa verde to the pan – cook and stir for 2 minutes. Don’t allow the mixture to bubble or simmer. Not it’s time to assemble. 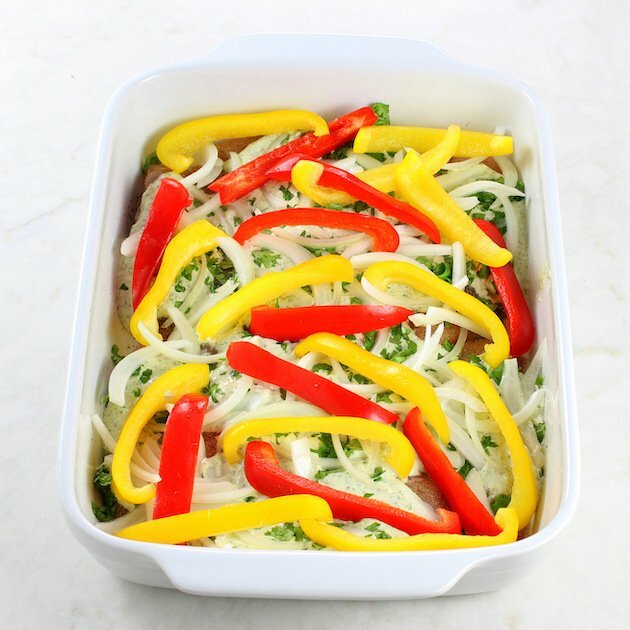 Add a little olive oil or cooking spray to your favorite 9×13 casserole dish. 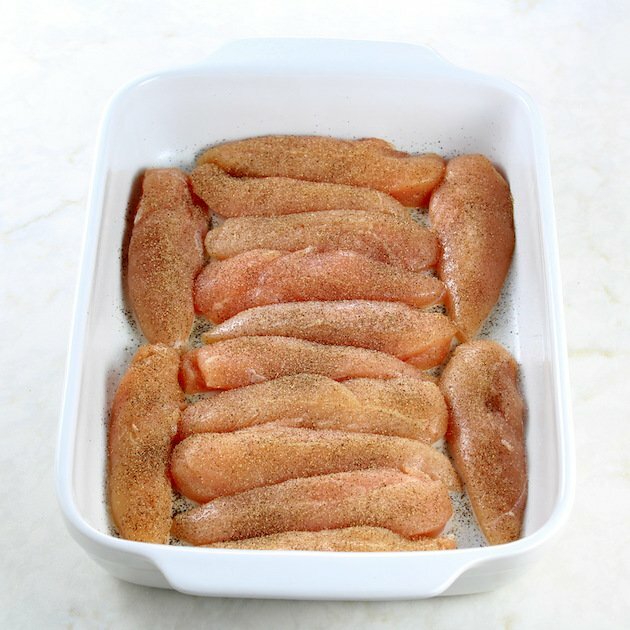 Add the chicken tenders in one layer. Sprinkle the chicken with salt and pepper. Pour half of the salsa verde mixture onto the chicken. Now add half the cilantro, peppers and onions to the baking dish. Cover with the rest of the sauce. Layer on the rest of the cilantro and the veggies. Now, sprinkle on the shredded cheese. Cover with tin foil and bake for 20 minutes. Remove the tin foil and bake for another 15-20 minutes, until your handy digital meat thermometer tells you that the chicken is at least 165F. Garnish with cilantro, diced jalapenos, tomatoes, olives or whatever your heart desires. Then devour! And there you have it… chicken salsa verde (aka “pollo en salsa verde”) on the table in less than an hour. An easy and low-carb chicken tender casserole that will satisfy all your cravings for Mexican comfort food! 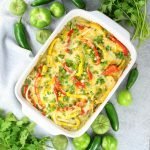 This Salsa Verde Low Carb Chicken Casserole is one of those easy chicken casserole recipes that is quickly going to become a family favorite. Preheat the oven to 350. While the oven is preheating, prepare the onions and peppers. 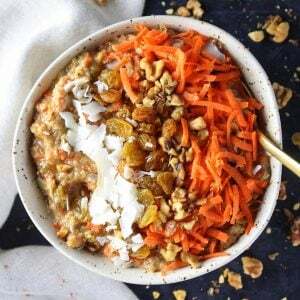 In a small bowl, mix sour cream, almond flour, cumin, salt, pepper and garlic powder. Heat and melt the butter in a saucepan on the stove over medium heat. Add the sour cream mixture and stir. Let this heat up slowly for 3 about minutes but watch it closely and do not let it start bubbling or reach a simmer. Controlling the heat will help your sauce to stay creamy and not separate when baking. Stir in the salsa verde and continue to cook for another 1-2 minutes, again not allowing the mixture to bubble or simmer. Then remove from the heat and set aside. Spray the bottom of your casserole dish with cooking spray. Add the chicken tenders and sprinkle with 1 tablespoon chopped cilantro, salt and pepper. 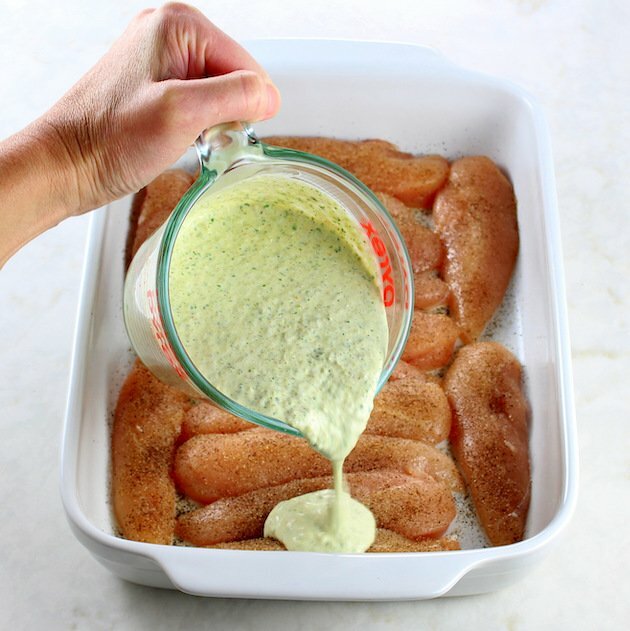 Pour half the sour cream sauce over the chicken. Add half the peppers and onions, then pour the rest of the sauce on top. Sprinkle with another tablespoon of cilantro. Add the rest of the veggies and sprinkle evenly with the cheese. Cover and bake for 25 minutes, then uncover and bake for 15 more minutes, until the chicken measures 165 degrees on a meat thermometer. 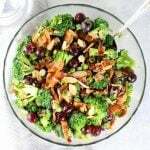 Cool for 10 minutes then serve, garnishing with your favorite toppings. This sounds SO delicious and I am totally here for that homemade salsa verde mixture. Sign. Me. Up. 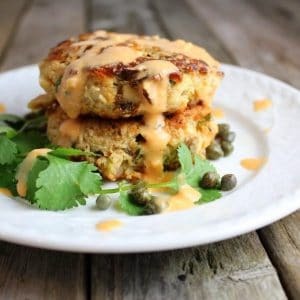 You hit the nail on the head- we eat so many carbs without even thinking about it, it’s great to have new dinner ideas that are easy but don’t rely on them to be delicious! Definitely adding this to the rotation- such a crowd-pleasing option! Thanks so much, Monica! I hope your family enjoys it as much as mine! 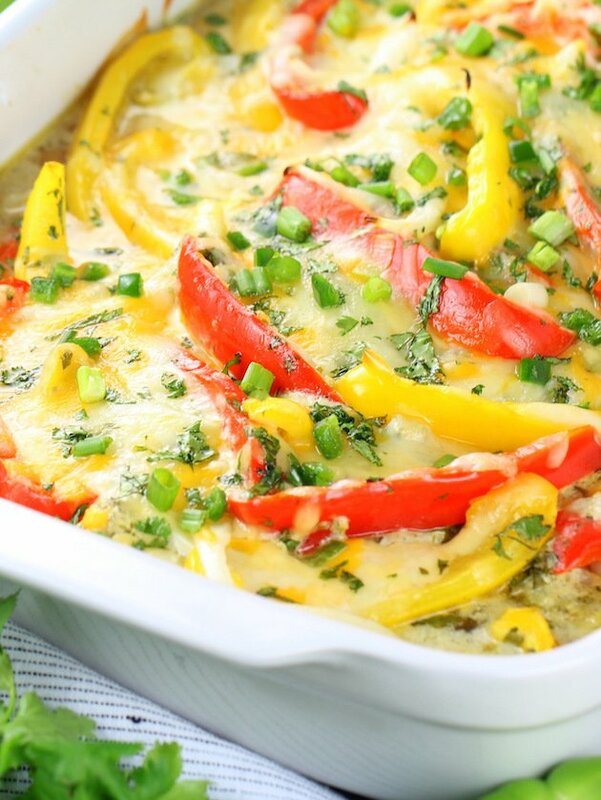 This casserole sounds perfect for dinner on a busy weeknight! Love the flavour combos you put in here, sounds soo yummy. Pinned! I’m having friends over the New Year and I need a casserole everyone will love. 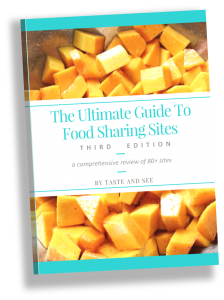 This has so many delicious fresh ingredients that I’m sure everyone is going to love it! The color, the cheese, the (low)carb – love everything about this! 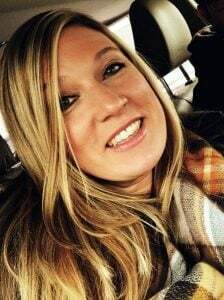 This one has family favorite written all over it! Love me some salsa verde and this recipe looks wonderfully straightforward! I also wanted to congratulate you on your food photography! Gorgeous pics! Mmm, this looks so good! Love to find new chicken recipes. So much flavor, and love all the colors! Thanks a bunch, David! 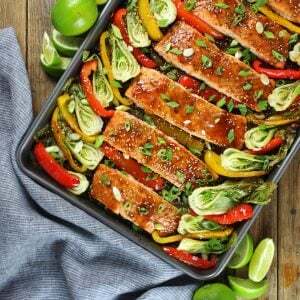 This dish is full of so much yummy flavor! What a great weeknight dinner! I love that you can just layer this in the pan and go. The sauce looks so flavorful and must add so much moisture to the dish! Wow! I could eat this for dinner every night. I looks delicious thanks for sharing. Ha! I feel the same way, Anne! 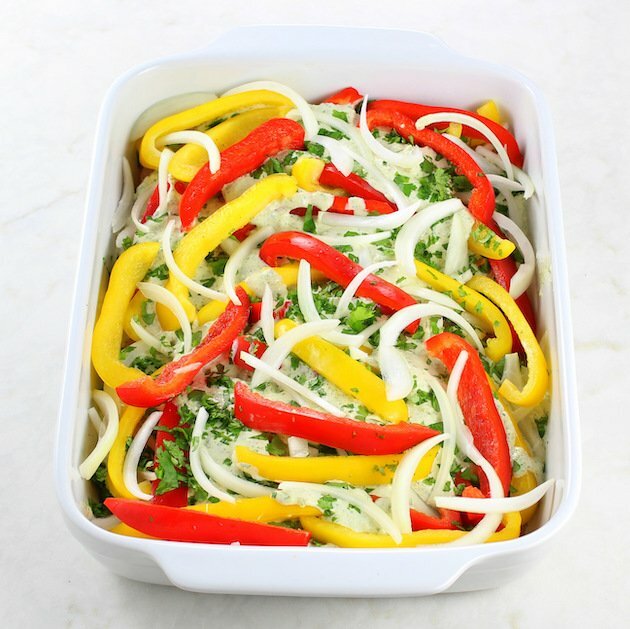 We love this casserole! Ahh what a perfect low carb meal to warm up in the winter. The cream, chicken, and heat make it perfect for that. Also the ingredients are super simple, surely I have everything to make this tonight!